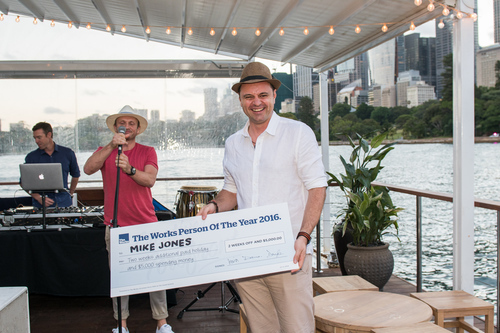 Early 2017 the inaugural People & Culture Award, founded by iknowho in collaboration with AdNews was awarded at the AdNews Agency of the Year Event. A staggering 7 finalists were announced in the category, and all were winners in our eyes. Each entry outlined incredible initiatives to enhance their culture and demonstrated that their people are critical to their success. We will share the best of the best with you from our series of interviews with the 6 finalists and the winners. We caught up with Jasmine Lansdell, People and Culture Director at The Works to learn about their initiatives in the second interview of the series. What does People and Culture mean to The Works? In this agency and in terms of business strategy people and culture are our number one priority. I think that’s quite different to other agencies where work or clients are priority. It’s absolutely the people here that make the agency great. It’s been the people that have driven the culture to where it is now, and we will continue to make the culture even better! I don’t think we would have a successful business unless we had great people and a great culture. Why did The Works take the direction of culture first? If people are happy and are motivated, if they’re interested in what they do, they will ultimately produce great work for our clients, and they’ll be proud of the work they produce. This means that we’ll retain all that great knowledge, keep employees here but also help them with their career ambitions. What prompted you to enter the AdNews People & Culture award? Being in any agency, culture is a really big aspect, and if we can enter awards to be rewarded and recognised for our culture then we will. The AdNews award was something that we were passionate about and we had stiff competition! It was also the most entered award. For us, it would have been great to win but to be named a finalist was a great achievement. When did you begin ensuring people and culture were central in the business planning? It always has been. It’s been driven through from one of the owners Kev; his biggest passion is people and making sure we have a really great culture. From day one it’s always been about making sure we have the right people onboard, and he has a very unique recruitment process - it’s all about the person. He wants to understand what motivates them, what they are like at their worst and their best - who they are is at the heart of why we hire someone. We also have 6 different founding pillars that we look at every year, people is one of these pillars, and one of the ones we put most investment in. It’s high on the agenda and that’s because all the owners and all the leadership team really do care about the people. If people are happy at work, happy with what they do, and happy in the environment, ultimately they’re going to produce better work and do a better job. If they’re unhappy, that will show through in the work. Even if someone produces something great, the way you present it, the way they care about it and finesse it, will always come through. If they’re happy and motivated, they will take it to the next level. What are the main initiatives the company currently has in place to support its people? We have a lot of initiatives! It really depends on the person and which initiative suits them. We have initiatives that supports families – return to work bonuses, and maternity/paternity leave, as well as flexible working across both genders which is quite rare. For the Gen Y members of the team who aren’t necessarily thinking about having children anytime soon, then we have rewards and experiences for them to enjoy with their family and friends. We also have experience based prizes for employee of the month which could be anything from a casino night for them and their friends, a beach weekend away, a boat trip – these kind things people absolutely love! We also do things that are more under the radar that make people really happy. If someone does a really great job or has gone over and beyond, then we send them a bunch of flowers to their home, or send them on a spa weekend! We want to make it feel personalised and individual. We send out engagement surveys every 6 months and track how we’re going with different things, and we ask for feedback. From that feedback we realised that return to work bonus supports quite a lot of people in the business but what about all the other people it doesn’t support? So we have something in the pipeline that supports them to the same dollar value so they feel that everyone is equal. Again, I’d say that training and development is important. Everyone has individualised development plans, and from that they can pick training that supports their development needs. It could be finding a mentor (we help find mentors in the industry), or perhaps it’s going on a specific training course, maybe it’s having more face time with someone in the business, again, it’s very individual and personalised to what that person needs. Have you ever implemented an initiative that didn’t deliver the expected results if so, how did you manage this with your people? I haven’t experienced that but I think they’ve tried and tested a few things. The business is very transparent, and it’s because the owners are in it every single day; they live and breathe the culture. We move in a quick and agile way, if something doesn’t work then we’re happy to receive that feedback but act quickly and change it for something else, and then get feedback on that! The way that we’re working is very employee experience based; anytime I’m thinking of doing something new, I’ll have a focus group, understand what the needs are of those people, what they find frustrating, what they find great, and use that as research and a base to what we should do next, and then test and learn. I think that’s from listening to our people, understanding what their needs are, and that different people have different needs. We’ve been looking at how we can better communicate and make people’s lives better - that’s how you should innovate. We don’t believe in innovating for the sake of it, it needs to be purposeful and useful. How do you measure the success of the initiative you implemented? Through award entries, but most importantly it’s engagement surveys; we always ask, ‘do you believe that this is a great place to work?’ In our last engagement survey we got 97.5% engagement of people saying that yes, it’s a good place to work. This figure has seen continuous steady growth, so now we’ve set the bar quite high and we hope it will continue! It’s also about getting a feel for the culture, for me, I like being on the ground speaking to people, you need to be present to represent the people properly. I sit in the middle of the creative department so I can understand what the heart of the business is doing; I jump in conversations, I go to social events, I make sure I’m there – being a part of the culture and not being removed. I put in one-to-one’s with people randomly or just have a chat when they’re making coffee – you actually get a lot just from doing that, I would say we always know what’s going on with our people! How often do you need to review the people initiatives you have in place? It’s on a continuous basis. We should always have our key initiatives, keep measuring them and see if they are working, and then every 6 months have a check in to see if anything needs revising slightly. Work is evolving, what people want is evolving, we need to move at that same pace. We don’t want to get to the stage where we have too many initiatives, because it doesn’t mean anything. We want to find the initiatives that are most meaningful, and represent our business well. Everyone loves birthday day off! We have The Works anniversary day off so employees can spend it with family. The initiative that has made the biggest impact on the industry is the return to work bonus – it’s been really well received. It gives the primary care giver $100 a day in childcare for their return to work so they could get $500 a week to support childcare – which is so expensive these days! A lot of parents ask themselves if they can actually afford to go back to work, or would it be more financially beneficial not to? To retain our great staff that have been with us for a long time, we recognise if we can do something to intervene at that point, we’ll get more people back. We support flexible working so if they want to come back on a flexible working basis, we just work out what’s going to be best for that person, the role and the business. It would be myself and one of our owners Kev. Having that backing from one the owners makes it really work; people are really excited about it, and he is just fantastic with the people! He can make something so real and resonate with people in a way that I haven’t seen with anyone else. He’s a great backer! We definitely hire for behavioural fit – people don’t necessarily need a traditional advertising background to work here, they just need the right attitude and approach. I think that makes our culture inclusive, they really give people a try here. A lot of people have moved sideways, or trialled roles out, and we’re honest about it if it doesn’t work. From an internal hiring perspective, we are really open. We try to make sure we have gender parity; in the leadership team we have 40% females represented – we want to get that to 50%, so are purposely looking at hiring more females into senior leadership roles. The same goes for the creative team - we don’t have enough females in those roles so we are looking at a programme that will support that from the ground up. I think they like working here as they feel part of the business. Everyone is super passionate about The Works because when you come to work here, you go through so many emotions that you feel really attached to the business. You’re supported the whole way and you have the people that own the business who make you feel really wanted. Because of that, it creates a much more personal connection to the business. And that’s why I think people like working here. People who work here want to work here. No I think it gives a great positioning because we can try things it would take a network agency 2-3 years to get through. We are really in tune with our people. I think network agencies are great but they aren’t as on the ground as we are. I see it as a massive bonus! I think they need to listen to their employees, which client-side does a bit better by understanding the needs of employees and reflecting this in their perks or approch to work. I think it’s around listening to the people, understanding their needs and being flexible towards them. I think where agencies fall down is that at times they need people to graft and work crazy hours, and people don’t want to do that anymore, and they know they can go elsewhere where they don’t have to do it. As an agency, we need to be honest enough and recognise that if we burn people out we will lose them. They will go client-side and have a smoother ride, earn decent money and have great benefits. People still do want to work in agencies as the work is more interesting and varied and there is more of a thrill, but we need to incorporate that with having more work life balance, great benefits and enjoyable environment. What three words would you use when summing up the culture at The Works?